Piedmont Health has created a new position – chief operating officer – to oversee the organization’s seven community health centers. The first person to hold the post, Misty Drake, started work in late August. Misty Drake in her new office. Drake came to Piedmont from Chicago. She has considerable experience in community health center administration. 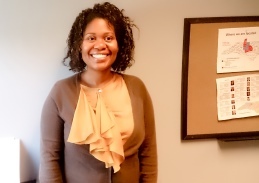 Before joining Piedmont, she served in administrative positions at three community health centers in the Chicago area – experience that stretches back to 2000. She also has been a member of the Board of Directors of the Health and Medicine Policy Research Group, a group that works to promote health equity, since 2009. In her new position, Drake said, she will be responsible for “all operations of health centers,” from patient satisfaction to facilities maintenance to compliance with government regulations. Drake said she is particularly interested in community relationships and was happy to see that Piedmont had a strong focus on that area. Drake, 38, has spent much of her professional life in Chicago. She was attracted to the job at Piedmont Health after visiting the Triangle area several years ago. Drake lives in Chapel Hill with her husband, Steven, and her children Gracie, 8, Ellie, 5, and Sammie, 14 months. Her mother-in-law, Joyce Drake, also made the move with her. She and her family are happy with the area so far, enjoying the walking trails, libraries and “biking as much as possible,” she said.